Constructs an inscribed gravestone, with a buried inventory chest, wherever a player dies. Generates a gravestone at the location of a player's death. The gravestone will generate an inscription displaying the player's name, date of death and game session time. A "Treasure Chest" will generate beneath the grave containing the deceased player's inventory and armor items. Gravestone elements will only replace "natural" blocks such as dirt, sand, grass, gravel, netherrack, etc. This may be turned off in config.yml. Acts as a useful indicator, especially in SMP games, where players may gain better knowledge of exploration attempts and history within the game. Configurable options, Permissions and WorldGuard support. Use config.yml to apply custom settings to available Gravestone options. enable-white-list false Use this to activate the white-list.txt. Once active, only usernames listed here will be granted gravestones upon death. only-build-grave-on-natural-material true Grave sections will only render-replace "natural" materials such as dirt, sand, grass, gravel, netherrack, etc. Set to false to allow grave blocks to replace any material. enable-fancy-grave true Enables a "fancy grave" which adds dirt and roses around gravestone. Setting this to false will generate a "basic" grave consisting of only a gravestone with sign. create-buried-inventory-chest true Enables the creation of the buried inventory "treasure chest". Set this to false if you don't want this feature. display-date-time-of-death true Displays the date and time of a player's death. fancy-grave-material dirt Material used around a fancy grave. allow-unlimited-graves-per-player true Default is true to allow for unlimited graves per player. When set to false, a player's prior grave will disappear and the area's original contents will be restored. If the player's grave block has been altered after construction then the prior grave blocks will not be reset. This avoids the potential for griefing. grave-stone-material smooth stairs Used to set material used for gravestone. enable-grave-lightning-effect true Lightning effect upon grave when player dies. Set to false to turn off. enable-fancy-grave-side-decor true Turns on the side decor for a fancy grave. fancy-grave-side-decor red rose Sets the decor used for the side decor of a fancy grave. only-build-grave-if-player-has-inventory true Only build grave if player has an inventory. Set to false to turn off. allow-grave-in-normal-world true Enables grave creation in the overworld. allow-grave-in-nether true Enables grave creation in the Nether. allow-grave-in-end true Enables grave creation in the End. Use white-list.txt to limit grave creation to certain players. Note: Set enable-white-list: true in config.yml to enable the white list. Use black-list.txt to deny grave creation for certain players. description: Player permission for construction of a grave. description: The default gravestone command. 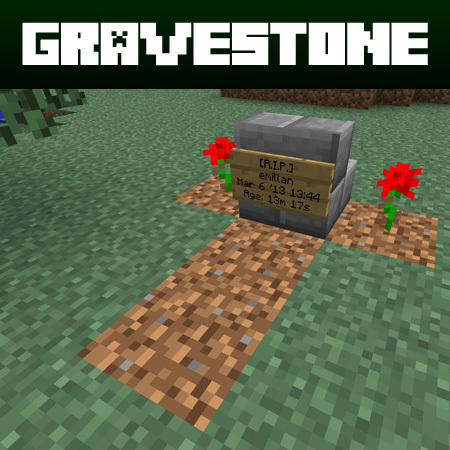 description: Provides info about the Gravestone plugin. it doesn't work for non admins players on my 1.9.4 server. how do i change the permissions so it will work for them. i hate being that guy.. but any chance on a 1.11 update, i only bug because NONE of the other "death" plugins work and this is the one sounds best! once i figure it out ill post the command here for ppl as reference. both do the same things but with different color text. just gives small amount of info telling you what it does. 3.) (known issue) sign placment on side of stairs bc stairs spawn in wrong orientation. Thanks for the report. I will look into updating this for 1.9 Spigot. I use this on my 1.8 server, and aside from the stairs pointing right it works fine! HI!! your plugin is so awesome! you should update it to 1.8 :) so i can use it on my server! So... odd question but I was wondering if anyone else was having this issue. My gravestones spawn with the stairs pointing to the right so that the sign ends up on the side of the stairs. Anyone else deal with anything like this? Hi Great mod! Works really good! I have a question though, no clue how hard it is but. Could it be possible to Replace the "spawned chest"(with loot of dead player)"
with "dirt" after chest is looted? I do have the WorldGuard hooks in place for this so give it a whirl. I tested myself for 1.0.9 and it was working for me. Does this support worldedit? worldguard? would be cool to graves not generating to spawn or other places where its forbidden. New feature: Set single or unlimited graves per player. This will help avoid grave-clutter. Default is 'true' to allow for unlimited graves per player. When set to 'false', a player's prior grave will disappear and the area's original contents will be restored. If the player's grave block has been altered after construction then the prior grave blocks will not be reset. This avoids the potential for griefing. New feature: Only build grave if player has an inventory. Set to false to turn off. New feature: Lightning effect upon grave when player dies. Set to false to turn off. Config update: Added ability to change material used for gravestone.